Rehearsal 1965 MJFO Orchestratra Dizzy Gillespie playing trumpet, Gil Fuller Conducting. Join me and the families and spectators. For the best results please listen to the songs simultaneously for a full experience. The sounds felt when Jannat was eleven years old in Sitting In @ 1965 Monterey Jazz Festival saved her life when diagnosed with breast cancer in 2000. She had fallen in love with the sounds of jazz music and the words it inspired her to write. Jazz cultivated a sense of freedom and universal love making a wonderful transition and departure from the Civil Rights Movement and the riotous flames that engulfed L.A. a month before the Festival’s opening. Her father Gil Fuller was the Conductor and Orchestrator for the Festival giving her a front row seat at rehearsals, live performances and the recording of the two albums in October 1965. Dizzy Gillespie & James Moody were the featured artists who were very much a part of her family. In a tumultuous world, Sitting In is this baby boomer’s Jazz Call and Response to reconnect and heal the soul through grace in a perfect way through sounds and words. It is returning to the universal language of music that cultivates peace and a better communication of love. Through the poems and narratives, the songs speak to everyone a truth that can relate and compose a life created with a soul filled wisdom opening up our hearts and a life of abundance, wisdom through self-expression. 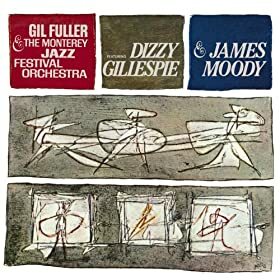 Inspirational audio download: Dizzy Gillespie & James Moody With Gil Fuller & The Monterey Jazz Festival Orchestra May 13, 2008 Streaming Listen with Unlimited Listen to any song, anywhere with Amazon Music Unlimited. Thank you for giving me life. Mom and God gave me all the rest. Here’s what I have learned from my greatest teachers…. My journey began from the 1st sound of you humming the song you wrote for me. Releasing my heart to search for the life that is waiting for me. The summer of 1965 would be my master class in the art of jazz improvisation. Bringing forth a Tsunamic red tide attacking, redefining Life with discordant notes of ignorance, illiteracy, desolation, fear and destruction. And so my song took flight. oh so important is to learn how to wait thru the strife. favoring harmonic progressions where tensions in intervals of 9th , 11th, or 13th abound. now you have the essence of a universal tranquility. Play it slant is the message best heard in the evening. of improvisational context is what matters in all you teach . where freedom and coordination can really dance. sharing that experience like the legends you’ve heard. Were secretly writing in your room. you will have to sacrifice your life. that words are the loves of your life. It is a choice that you cannot shake. It brings happiness, patience, love and peace. You are miserable and tortured if you don’t write. when it seems that the words are discordant and fretful. be humble and allow them the love and respect that you claim for yourself. I was very fortunate to have met your mother, she gave me you and your brother. So I did not have to make that choice alone. to God for the talent to write. Write your heart out, share your soul. That is what happens to me when I am writing a song. it is the fuel you’ll need to be who you are. It is not the number of years in a life that matters…it is the life in the years that counts. Mindfulness is the Survivor’s greatest weapon when it comes to managing living with cancer and dealing with life’s daily fun filled challenges. I wish that as part of the entire process after being diagnosed that the Integrative Oncology Wellness team would have been a part of the treatment team sixteen years ago. This way whatever the treatment plan coordinates so that it involves the mind in the spirit. It was as though my body went through all of the horrifying side effects and the mind and spirit were left in a state of limbo and confusion for extended periods of time. When the treatment was finished then I was given the all clear but there was nothing for what to do with my life from there with a new body and an unprepared mind. I was not only going through this alone, I was also my mother’s caregiver and there was no support. Now I find there is NO support for Survivors who live beyond the extended survival date. All Wellness Programs relate to those who are undergoing treatment and those that fall outside of that window as I have been and continue to be turned away. In essence there is no Support or Wellness programs available for survivors over 2 years. This is WRONG! So, I had to DYI my life and it was by using Mindfulness to deal with the Stress and to explore myself to find out what makes me happy now living with cancer. Integrative Oncology didn’t exist in 2000. Research has shown and Time Magazine has just done a special edition pointing out how Mindfulness is the way to a Happy and Healthy Life. With that, I, as a neuroscientist, Survivor Advocate, 16 year survivor and writer am LIVING PROOF that mindfulness in conjunction with building a daily practice using jazz improvisational techniques, and for me Poetry is what gets me to Show Up as Survivor who, through time found a path that some days are good and others not, but, I am not suffering as a result. Who wouldn’t want a Happy solution…. So here are the 9 EZ steps to putting a little creativity into your way precious and valuable life. Creativity – is having the ability or power to create. It is characterized as living in the moment and evokes approaching life with originality or looking at life with a fresh perspective using your imagination and expressing yourself in a style that is uniquely You. Sounds cool right? So why not live like this every day? Sometimes the hardest part is taking the first step. Step out of your daily routine and did something totally different? Take a dance class, go to a concert or try a new jazz club near you to experience something that is a departure from your normal routine. Try a new radio station or grab a pencil and start sketching the trees in your own backyard or a park where you see children (they could be yours) take a vegan or gourmet cooking class @ a Natural Food Store to engage in a creative action. Creative thinking and creative action occurs when you decide that you want to jazz up your everyday life. Create something with your own hands on a regular basis. Set the table following a layout from your favorite magazine, i.e., I like Coastal Living they have wonderful recipes and table settings that are really festive and different. Make time to try something new. For example go to the art section of your favorite department store and come up with a theme for the centerpiece with flowers, object, etc. Check out DYI sites on your computer. It is a lot of fun when you do it as a family and or friend thing. Express yourself through movement it could be dancing to music or watch a classic film, game or performing arts of a play or opera. creativeStart a writingor book club. You have the option of creating whatever fun filled game board night, or learn a new dance step or routine to break away from your usual nightly routine. It does not have to cost a lot of money, just use your imagination. Integrate Creativity into your daily life. Begin by scheduling time on your calendar for it. You don’t have to go crazy. Start off with maybe twice a month. Make it an intention as you would when you are meditating for a positive and productive day. Chances are you will not consider it foreign or uncomfortable because you are pacing yourself to experience life differently. Pick your own pace and find Parks and recreation programs that go to Wine Country or Hiking or Ballroom Dancing where there is not a long term commitment and you can sign up without going into debt. My cable company has dance, yoga, exercise as part of the cable package for free! Design or make something for your office or your room that is made by you. Your surroundings are a reflection of your uniqueness. Inspiration is the catalyst for more creativity, grace and character. So it is wonderful to surround yourself with objects that you make or you find in unusual places. Hand-made objects evoke vivid memories as well as diversify your experiences. Find interesting and exotic creative spaces. Museums, art shows or galleries, outdoor exhibits, theatres and outdoor performances will places remind and cultivate our innate creative abilities. Inspiration is everywhere! Check with friends, family, coworkers, etc. suggestions of creative ideas they enjoy. Get the conversation on creativity going. Let your creative juices flow and explore everything! Keep in touch with your creative network. Dialog and you will both be inspired. Talk about unique and unusual experiences to friends, email, start a blog or a Creative Living Circle. Just be relaxed and free to do whatever suits your fancy.